Estimated Time (Reading & Exercises): ~90 min. You are welcome to join our Slack Team. There you can ask and answer questions relating to this lesson under the #howto-regex channel. See How To for more. First, read this primer on regular expressions: Pattern Recognition: Regular Expressions and You. Lab students, you don't have to work through the crossword notebooks at the end, but you should work through the Regular Expressions 101 (regex101) examples. Also, you may consider consulting the readings under additional readings if you need help with the puzzles below. 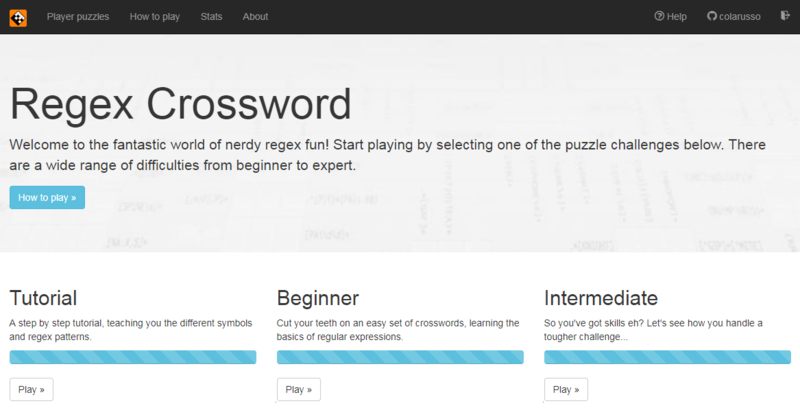 Now, test your skills by doing a few regex crossword puzzles over at Regex Crossword. Pro Tip: clicking on the "? Help" link at the top of the page will reveal a nice little cheat sheet. If you're a lab student, you should log in with your GitHub account (see Get Your Accounts in Order) and work through the Tutorial, Beginner, and Intermediate exercises. Once you've done this, take a screenshot like the one below showing your progress and GitHub ID. To show you've completed this exercise, DM Colarusso your screenshot on Slack.